On the weekend of January 16th-19th most of our players competed in the Dual Level 5. For the boys, this was a local tournament at the Tualatin Hills Tennis Center, but for the girls, this tournament was in Mercer Island Washington. LTA Coach, Angela Leong took a group of four girls including Katie Lorish, Christina Le, Betsy Sauer, and new LTA player Ellie Grossman. Katie beat Demie Warner handily in the first round, but was defeated by Meghan Cassens in the second round after Meghan exhibited a colorful display of poor manners and distasteful court behavior. Christina Le lost but had a very tough tournament, and met two very competitive players, Christy Sipes and Brittany Reed, in her first two rounds of the tournament. Britta Stime defeated Betsy Sauer in the first round in a close match, but Betsy was able to rally back and make it to the consolation finals. Ellie Grossman achieved great results in this tournament and beat Darby Rosette and Grace Egger in her first two rounds. Ellie pushed herself to the limit in her match with Grace, and was very excited to beat her—a fellow top-ranked junior. Ellie lost in a close match in the quarterfinals when she encountered Rae Cockreham—a very consistent junior. Tasha, Cadie and Allie also competed in this tournament and all three of the girls won their first rounds against Carlina Jow, Maria Johrarleva, and Fiona Cerf respectively. Tasha, Cadie and Allie lost their second rounds in close matches against Lea Jansen, Erin Larner, and Nora Tan respectively. 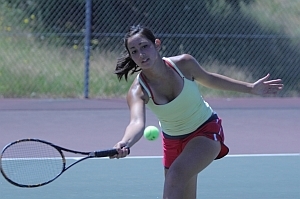 Arianna Fardanesh played in the Girls 16s division, and beat Kira Kearsley in the first round. She was defeated in the second round by Sasha Carter, who went on to win the tournament. Meanwhile, the boys were playing in the THPRD Dual Level 5 back in Portland. Peter Beatty played in the Boys 16s draw and lost two close matches to the third seed Jamie Thorp and then to Mathew Alderson. Nick Mulfur also had a very tough tournament and was defeated by Ratan Gil and Andrew Smith. Jenya made it to the finals of this tournament, but lost in a close match to Alex Rovello. Lastly, Sam beat Will Cooper handily in his first round, but was defeated by Alex Wallace in his second.